Why is Aqualine considerably cheaper than other companies? We maintain very low overheads and have absolutely no middlemen, our suppliers are exclusive to us and give us the most competitive prices in the marketplace today. Aqualine is an independent company, this means that we have precise control over our saunas and are committed to making sure you buy the right products for YOU! What is special about the quality of Aqualine Saunas? It is easy to say we have the best quality saunas available like other companies, all of our suppliers are hand picked after we have eliminated the hundreds of suppliers worldwide who did not make the grade. We work very closely with our manufacturers to ensure they adhere to the strictest quality managements in the world today whilst securing exclusive deals only available to Aqualine. How many different ways can I place an order? Simply click on 'BUY' or 'ADD TO BASKET' next to an item of your choice and follow the steps to complete the order. Then you have the option to make payment in a variety of ways. We have ensured that this process is easy, simple and secure as possible. If there is any option you feel we haven’t covered, please contact us. 4) Once the order has been marked ready for dispatch, our delivery team will route your order for delivery over the next 3 – 5 days and call you advising of the delivery date. Can I return my item if I change my mind or do not like it? If you change your mind about the product when you receive it you can return it at any time within 7 days for a replacement of equivalent value or a credit against any item of higher value. If you cannot find anything that you would like to exchange the item for we will refund you for the item less the cost of collection. Can I get spare parts for my items if something goes wrong? We do have a large stock of replacement parts for all of our saunas, in the unlikely event there is a problem outside of the warranty period, and can ship them via next day service. We supply them at cost price and do not make profit on spare parts. Which gives you that extra piece of mind. All the material we use is non-allergenic, non-toxic and environmentally friendly. Our wood comes from renewable forests. Furthermore, we ensure electric parts are fully certified and energy efficient, they consume less electricity than that of standard units. Not only does this save energy, but money as well. We also go a step further and ensure that all of our products are manufactured to ROHS standards, which restricts the release of Hazardous Substances. Tell me about your saunas? This latest health and beauty development provides all the conventional benefits of a sauna and more through lower temperature sun-simulating technology. SaunaMed Infrared Saunas have been designed and developed to bring the whole Sauna experience to every home regardless of space and budget and with the wide range we have, there is something for everyone. The SaunaMed Sauna range has been commended for its ease of construction and variety of models available. The purchase of an Aqualine Sauna can be made with confidence from a name you can trust. ‘What is Infra Red energy you may ask?’ It is the warm glow you feel on a sunny day, which comes directly from the sun’s rays. That is why you can feel a sharp drop when a cloud blocks these rays – even though the temperature in the air has not changed. Far-infrared radiant heat is a completely safe from of naturally occurring energy that heats objects by a process called direct light called infrared heat or infrared energy. Absolutely, infrared saunas are safe to use without a doubt.! Infrared light energy is really beneficial and not at all damaging to the body. To illustrate the safety of the heater, Far Infrared heating is used in hospitals to warm newborn infants. Infrared has been researched and used in medical practices for many years. Sports medicine has long accepted and used infrared to promote healing of sprains and strains. NASA has also concluded after lengthy trails in the 1980's that infrared therapy is the best way for astronauts to maintain cardiovascular fitness on long cramped space flights. 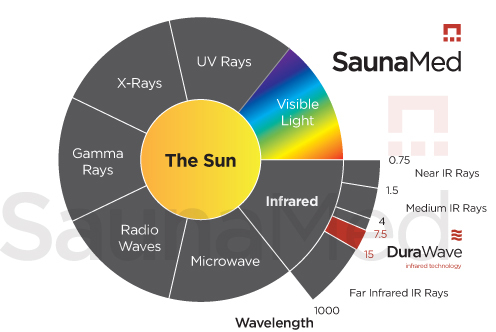 What is the difference between a SaunaMed Far Infrared sauna and a traditional sauna? Top spec radio, CD, MP3 system and Ipod connection Fitted as standard Available on some models. Speakers need to be mounted low and be water resistant. Everything Included in the price – No hidden costs – All parts available Professional fitting and wiring required. Traditional saunas generally cost more. I’ve heard about the amazing health benefits of an SaunaMed Far Infrared sauna, could you explain them in detail? I’ve seen other similar saunas advertised, what makes yours better for me? Our saunas are made from the Finest Grade Non-allergenic / Non-toxic Canadian Hemlock, or hand selected finest grade A Canadian Red Cedar, and are built with solid tongue-and-groove construction. They are compact, easy to assemble, they take only a few minutes to heat, plugs into a standard household plug, stands off the floor on 4 legs and won't damage your flooring. Also do not forget our proven strict quality management and wide range of accessories. All our infrared saunas are classed as Far Infrared saunas. This is the most beneficial infrared treatment for your health. What is Constant Concentrated Infrared? What are DuraWave™ Infrared Heaters? Are they backed up with Mediacal Research and Benefits? Yes Far Infrared saunas which use pure ceramic concave shape emitters are backed by a long history, extensive medical research and results. Why are DuraWave™ elements are preferred over carbon? What is EMR Testing- (Electro Magnetic Radiation)? Many doctors and medical experts are advising the avoidance of exposure to high levels of EMR. EMR is short for electromagnetic radiation or sometimes known as electromagnetic fields (EMF) or electromagnetic energy (EME). Electromagnetic fields are created when electric current flows, such as using a hair dryer, microwave or cell phone. Electro-magnetic fields (EMF) are a field of energy created by all electrically charged objects. EMF is given off by any appliance or transmission of AC (alternating current) electricity. Every day appliances around the home give off varying levels of EMF depending on their design and level of current. Items as varied as mobile phones, hairdryers, and electric tooth brushes to name but a few examples all give off EMF at some level. SaunaMed Saunas are designed to be therapeutic environments with the lowest possible level of EMF however due to factors beyond our ability to control, such as your household wiring and other potential background sources of EMF such as Wi-Fi networks, we are unable to guarantee that there will be 0mG of EMF within your sauna cabin. In designing the DuraWave heater technology that goes into every SaunaMed Sauna, our engineers have taken steps to significantly reduce the EMF given off by DuraWave heaters however it is possible that some EMF may be present within your sauna cabin given off by the heater elements. Many people fear that EMF causes cancer however even a casual connection between EMFs and cancer has not been established and widely accepted by the scientific community. Your SaunaMed sauna is entirely safe to use just like any other household appliance. A typical hairdryer will give off five times more EMF than a DuraWave heater. All known cancer inducing agents including radiation, certain chemicals and a few viruses act by breaking chemical bonds producing mutant strands of DNA. Not until the ultraviolet region of the electromagnetic spectrum is reached, beyond visible light, and far beyond the infrared spectrum do photons have the energy required to break chemical bonds and as such there is no corroborated medical evidence to support EMFs given off by household appliances can increase the risk of cancer. EMR Neutral infrared heaters by SaunaMed give off ultra low EMR, our patented technology ensures that you are never exposed to high levels of EMR in the sauna. Our ceramic heaters are wired in a unique way so that the ‘neutral’ feed runs alongside the ‘live’ feed. This neutralises most of the radiation. We are unable to guarantee that there will be 0mG of EMF within your sauna cabin but our technology reduces your exposure significantly. SaunaMed is one of the most widely accepted sauna brands used by doctors and other health care professionals. Residential users receive exactly the same product that healthcare professionals use in professional environments. *Please note that EMR Neutral™ heaters are designed to significantly reduce the exposure to radiation when compared to standard heaters. There may still be some small levels of EMR detected. On which SaunaMed models can I find the EMR Neutral technology? EMR Neutral™ heaters are used in all SaunaMed models. What is an Oxygen Ioniser? An Oxygen Ioniser is a device that rids the air of dust, pollens, bacteria, and other pollutants. Inside your Infrared Sauna, Oxygen Ionisers purify the air by removing allergens, dander, and odors from your Infrared Sauna. Leaving your Infrared Sauna air fresh and clean. Oxygen Ionizers work by creating an electrical charge to produce negative ions, which remove tiny partials from the air. The negative ions produced by Oxygen Ionizers seek out positive ions like pollen, bacteria, dust, mold, and so forth to bond. When the positive and negative ions bond, they become heavy dropping to the floor. The next step of course is to remember to clean out your Infrared Sauna every so often. The small negative ions are identical to the ions found in the invigorating natural environments such as the seashore, alpine regions, forests and waterfalls. We have ensured that our saunas are silent to aid in your relaxation. As with any form of exercise, it is important to build up a tolerance. Use a lower temperature (35°c) for about 15-20 minutes, initially 3 times a week. Once conditioned, many people enjoy daily sessions of up to 35 to 40 minutes. We suggest beginning at 35°C and working up to the higher temperatures. It is often not necessary to reach maximum temperatures and most benefits are experienced at lower temperatures. The older we get the more toxic we become. Many anti-ageing practitioners are now incorporating far infrared sauna therapy into their programs. It is important to note that most patients over sixty are dehydrated to some degree and this should be addressed by consuming fluids as instucted. Begin at 30°C and gradually increase the temperature. The sauna can be used by all people due to its safe heating apparatus. If the sauna is used at all for children under ten, it should be used for a short duration at a low temperature (30-40°C) and ensure fluids are replaced through drinking plenty of water. Good results have been noted with autism and ADD/ADHD. What is the best material for a sauna, there seems to be a lot to choose from? Our Canadian Hemlock wood does not give off toxins, under high temperatures, which pine and Sitka wood do. Our wood has a fine grain and virtually no knots, which eliminates the chances of splinting or any rough surfaces and gives a softer feel. Cedarwood gives off a pleasant aroma that can also have a therapeutic effect, as shown by thousands of years of tradition. When used for burning, cedar wood strengthens and harmonises, while the essential oil has a calming and soothing effect on nervous stress. The Indians used cedar wood for all respiratory problems as well as for arthritis, rashes and menstrual pain. Which are the best Infrared heaters, Ceramic or Carbon? Ceramic heaters are more advantageous as they heat up much faster, have a high emissivity and they are known for high levels of durability. Ceramic heaters are the most common and popular choice. Are there any chemicals used in the manufacturing process? We have perfected the manufacturing process to ensure that there are no toxins or chemicals within the sauna itself. We believe it is vital that our saunas provide a safe therapeutic environment for our customers to enjoy. To do this we have ensured that the wood used to build our cabins has not been treated with any chemicals. Instead we merely kiln dry the wood which helps it retain its naturally durability with no need for chemical treatment. We use only water based adhesives in the construction of the cabin as opposed to solvent based adhesives. We allow the natural density of the wood and an air gap between the panels to provide the insulation, no manufactured rock wool or mineral fibres are used. We use DuraWave Heating elements which are filled with lava sand and contain no chemicals in contrast to some carbon heating elements which can introduce lead and styrene into the therapeutic sauna environment. What is the warranty on the saunas? We are so confident in the quality of our saunas that we offer a 5-year warranty on our wood and glass parts and 2 years on electric parts. If there is a fault with the sauna within this period, parts and simple replacement instructions will be sent out free of charge. I have a Hotel and want to offer benefits of a sauna. This would add to my list of facilities. I know the health benefits of Far Infrared sauna over a regular sauna. Are there other reasons? Yes, our saunas cost much less to operate and maintain. The Finest Grade Non-allergenic / Non-toxic Canadian Hemlock construction is best for your guests because as many as 15% of your guests may be allergic to sitka, pine and other timber. Also, the controllable temperature (18 - 65°C) will be healthier and safer for your guests. Why do you sweat up to three times more in an SaunaMed infrared sauna when it is less than half the temperature of a traditional sauna or steam room? Infrared is a radiant source of heat. This means it warms our body directly, rather than having to warm the air first - similar to the sun warming our body on a colds winter's day. This is a major difference between an Aqualine Infrared sauna and a traditional sauna. Infrared only expends 20% of its energy on heating the air - 80% directly warms the body to a depth of 4.5cms. This deep penetration of warming radiant heat produces up to three times more perspiration and therefore stimulates the deeper tissues and muscles to release stored fat and toxins leaving the user feeling refreshed, cleansed and energised. What about the pre-heating times? As mentioned SaunaMed saunas heat up in a few minutes so you can enjor your sauna whenever you feel like it, traditional saunas usually take 30-40 mins to heat up properly. Is the Far Infrared Sauna good for weight loss and burining calories? This is due to the radiant heat stimulating the deep tissues and organs to release stored fat and accumulated toxins. The Aqualine Infrared Sauna range gives the body an opportunity to release toxins through the skin, which is often referred to as the third kidney because it is believed to be responsible for eliminating up to 30% of the body’s waste. How do I burn calories and get a cardiovascular workout by sitting in an SaunaMed infrared sauna? NASA has also concluded after lengthy trails in the 1980's that infrared therapy is the best way for astronauts to maintain cardiovascular fitness on long cramped space flights. Far Infrared saunas have a stimulating effect on the cardiovascular system. As you perspire, your heart works harder to pump blood through your body. A 30-minute session in an Aqualine infrared sauna is equivalent to walking or jogging for 10 to 15 kilometres. Take advantage of these amazing benefits without leaving the relaxing warmth of your own spa, and without any dangerous impact on your joints. Infrared Heat penetrates deeply into the layers of skin. Perspiration removes the deep impurities, toxins and dead skin cells. Increased circulation draws your skin's own natural nutrients to the surface. Together with Infrared heat's cleansing effect, you will see a noticeable improvement in your skins texture, complexion, tone and elasticity. Combat the effects of daily stress and wake up your immune system. Deep radiant infrared heat results in a rising of your body’s temperature, identical to the body's defence mechanism against bacteria, microbes, and infection. The beneficial side effect of this induced temperature increase is immune system improvement resulting from increased production of white blood cells (leukocytes) by your bone marrow and killer T-cells by your thymus. When toxins are present in our body blood circulation is blocked and cellular energy is impaired. The body’s immune system is inhibited, which makes it difficult for the body to fight disease. Are your traditonal saunas domestic or commercial units? Our full range of traditional saunas are classed as commercial saunas, however they are perfect for use as domestic saunas. We firmly believe we have the best quality units with the most flexibility in the sauna industry. Is everything included with your traditional saunas? Our traditional saunas are comprehensive solutions. You get Aqualine’s high quality saunas, aesthetic design and easy assembly all in the same package, from the same supplier. All parts and accessories are included, even the sauna stones and a gift pack is included free with every sauna. However all Harvia indoor saunas do not come complete with a floor. Most of our customers choose to use a tiled floor. All the saunas are designed for easy self assembly. All that is required is a local qualified electrician to connect up the heater to your electrical supply using an adjacent isolator. If you need help with the main cabin assembly, a local carpenter can do this. Do I need to upgrade my electrical supply to accomodate a traditional sauna? You will need to upgrade your electrical supply if your heater is rated above 3kW. A local electrician can easily install this. Most of the smaller saunas will not require an upgrade. You can find the heater rating on the individual product pages. How much time should I spend in a traditional sauna? A typical session in a traditional sauna lasts about 10-15 minutes. Many sauna bathers will often have several sessions in succession, with short breaks in between to drink some water, shower in cold water and generally cool down a bit. What is the ideal temperature range for a traditional sauna? 180°F - 190°F is probably the most typical temperature range in a traditional sauna, however personal preference and comfort level is the most important thing to consider with sauna bathing. What kind of electrical requirements does a traditional sauna have? Almost all traditional saunas will require a direct 240V hook-up to the household electrical system. Some smaller sizes that only require a 2 kilowatt heater are available in a 120V electrical configuration. Will I need to install a drain in the floor? In almost all circumstances a floor drain is neither required nor necessary. Any excess water or moisture can be easily taken care of by allowing the heater to run for a length of time until the heat has evaporated the moisture. However in some cases, such as when the sauna will be used for commercial purposes, a floor drain may be required to comply with building code. What considerations should I make for ventilation? All of our traditional saunas come with ventilation built into the walls, and will have plenty of fresh air circulated in from the outside environment, even if the sauna is installed indoors. Can any stone materials serve as heater stones? Heater stones should be of a material that is as heavy as possible, dark in colour, and large in size for them to be able to store as much heat energy as possible. Heater dealers sell stones that are purposely intended for use as heater stones and which come from well-known suppliers, and whose composition and suitability are guaranteed. Stone material that is well-known and suitable for use in heaters includes: peridotite, olivine and olivine-dolerite. Heater stones must be arranged loosely to ensure there is good air circulation. All of our sauna packages include sauna stones with the heaters. How often they are changed by and large depends on how much the heater is used. If it is an average of twice a week, the stones should be changed once a year. It is a good idea to rearrange the stones occasionally, as they tend to crumble with use, making the area more compact and therefore obstructing the free circulation of air. Good air circulation will ensure that the heater works properly and the resistors too will last a long time owing to lower temperatures at their surface. On our traditional sauna ranges, the first step is to decide on the wood material to be used on the outside, inside and ceiling of the main sauna cabin. The availiable options are listed in the first drop down menu on the individual product pages. 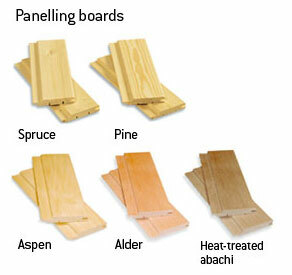 Options can include spruce, pine, aspen or alder for your Variant sauna wall and ceiling panelling. The Rondium and Rubic ranges also have the option of heat-treated abachi. Spruce panelling is slowly grown, healthy and a tough Finnish softwood with sound knots that enliven the surface. Spruce secretes very little resin, and the wood retains its light colour for many years. Pine panelling is made of pure pine board that has a slightly red tinge. Its looks improve with age, and it darkens beautifully as the years pass. The faint fragrance of pine resin resembles clean pine forests. Aspen is a traditional sauna material because of its characteristics. 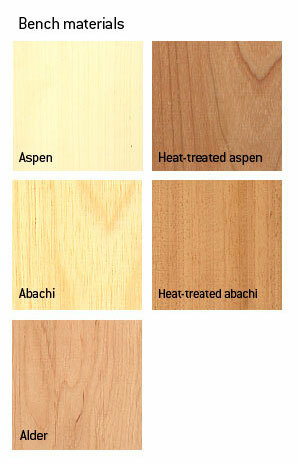 Aspen's light and even colour is long-lasting and creates a fresh atmosphere inside your sauna. Alder has a refined shade of red which deepens with age. It's slightly variegated and easy to care. Heat-treated Abachi has undergone a treatment process of 150°C heat. Although all woods are kiln dried to avoid warping and splitting, this wood has endured much higher temperatures. The second step is to select your interior style and bench material. Again the availiable options are listed in the second drop down menu on the individual product pages. The interior packages include benches, backrests and other elements to complete your sauna. If availiable, you can choose from four interior alternatives; Formula, Exclusive, Solar and Futura. Formula: Simple lines, fresh forms. Formula is the right interior for you if you appreciate linear design. The basic Variant sauna package includes the Formula interior made of abachi unless you specifically select another wood material or interior design. Formula uses abachi, aspen, alder or heat-treated aspen as the material for the benches, backrests and bench surrounds. Exclusive: Bright wood surfaces. Soft, tasteful lines. Furnish your sauna elegantly with Exclusive. The benches, backrests and bench surrounds are made of abachi, aspen or alder according to your taste. The Exclusive interior's benches are detachable and therefore make cleaning an easy task. Solar: A new type of design. An interesting combination of colour and lines. If you want your sauna to be really memorable, Solar is for you. You can choose from abachi, aspen, alder or heat-treated aspen for the bench material, backrests and bench surrounds in Solar. The Solar interior's benches are detachable and therefore make cleaning an easy task. Futura: Wood and metal - a bold combination of materials brings a message from the future of saunas. The steel strip embedded in the front of the bench and the slim battening used on the benches give the Futura sauna interior a modern look. The same line is continued on the light fittings and heater guard. The interior features modern slim battening. Select the material for your Futura sauna interior from aspen, abachi, alder, or heat-treated aspen. The Futura interior benches are detachable and therefore make cleaning an easy task. Ventura: Something completely new for your sauna! Ventura's benches, backrests and bench surrounds are made of form-pressed veneer glued in layers. Thanks to the rounded bench finishing it is very pleasant to sit on the benches. Lamps are integrated in the backrests. The third and final step is to decide on the material to be used for the benches. We use easy-care abachi wood by default as this wood stays fairly cool against your skin in extreme heat. However there are sometimes other options availiable depending on the model, should you wish to select them.